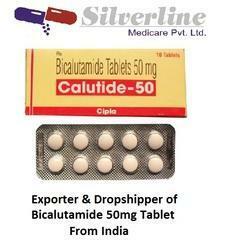 Bicalutamide is used to treat prostate cancer that has spread to other areas of the body. It is used in combination with hormone treatment. This medication works by blocking the action of male hormones in the prostate, slowing growth of the tumors. This medication should not be used in women or children. Flushing and sweating (hot flashes), body aches and pains, breast swelling/tenderness/pain, headache, dizziness, drowsiness, trouble sleeping, weakness, hair loss, weight changes, constipation, diarrhea, stomach upset, gas, nausea, vomiting, and loss of appetite may occur. If any of these effects persist or worsen, tell your doctor or pharmacist promptly. Remember that your doctor has prescribed this medication because he or she has judged that the benefit to you is greater than the risk of side effects. Many people using this medication do not have serious side effects.Tell your doctor right away if you have any serious side effects, including: decreased ability/desire, vision changes, numbness/tingling of the hands or feet, swelling of the arms/legs, unusual or easy bleeding/bruising, signs of kidney problems (such as change in the amount of urine), painful urination, signs of infection (e.g., fever, chills, persistent sore throat), trouble breathing, persistent cough, mental/mood changes (e.g., anxiety, depression). We have marked a distinct and dynamic position in the market by providing Silofast 8mg Capsule. This Silofast capsule is prescribes for the treatment for symptomatic relief of benign prostatic hyperplasia. The offered Silofast capsule acts by blocking alpha-1 receptors in the prostate, bladder, & urethra, relaxing smooth muscle. 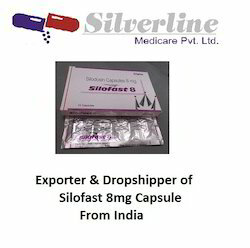 Customers can avail this Silofast capsule from us at affordable price in a given time frame. Aldactone is used as a water pill (potassium sparing diuretic), so as to help the body rid itself of unnecessary sodium and water, while at the same time reducing the amount of potassium lost. In some cases, this drug has been used by patients to treat unwanted hair growth (hirsutism), acne and seborrhea. Male to female have also used it as part of hormone replacement therapy. Aldactone is used as a water pill (potassium sparing diuretic), so as to help the body rid itself of unnecessary sodium and water, while at the same time reducing the amount of potassium lost. This drug may be used to treat high blood pressure, edema (fluid retention) in patients affected by congestive heart failure, liver cirrhosis, nephrotic syndrome and low blood potassium levels (hypokalemia). It is often referred to as an aldosterone receptor antagonist, and can be used to treat a condition called hyperaldosteronism. In some cases, this drug has been used by patients to treat unwanted hair growth (hirsutism), acne and seborrhea. Male to female have also used it as part of hormone replacement therapy. Some people believe that it may have possible benefits in treating male pattern baldness. All patients undergoing treatment with Aldactone must first consult their physician for a full medical assessment. The dosage regiment prescribed will be decided by the prescribing physician, based on factors such as the condition requiring treatment and the patient`s medical history. Adults treating hypertension, edema or hypokalemia may be prescribed a dosage ranging from 25mg to 200mg per day (in 1 to 2 divided doses). However, the exact amount will depend on the physician`s medical opinion. When used to help diagnose primary hyperaldosteronism, the patient may be told to take 100mg to 400mg per day (in 1 to 2 divided doses). Treatment of hirsutism, congestive heart failure and primary hyperaldosteronism may require different dosage regiments. Serious reactions are less common. You will need medical attention immediately if you experience fever, appetite or energy loss, bruising or bleeding, vomiting blood or blood present in the stools, a decrease in urination or any other serious side effects. Your physician may order laboratory tests in order to monitor your body`s response to this medication. Ask your physician about how much foods which are rich in potassium that may be eaten. If you have an allergic or hypersensitive reaction, seek emergency medical attention. Possible symptoms include difficulty breathing, difficulty swallowing, swelling, chest tightness, skin rashes, and hives. Aldactone should only be used as instructed and prescribed by your physician or pharmacist. Do not alter your dosage unless specifically instructed to do so by either of the above. Dosage and usage often depends on the severity of the condition, as well as the patient`s medical history and foreclosure you begin using this medication, ensure your physician is aware of the following health condition. 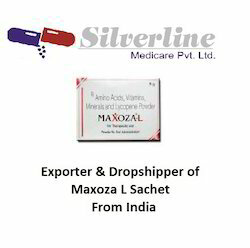 Maxoza L Sachet is largest selling brand for Male infertility. Maxoza L is No.1 prescribed brand for male infertility. This medication is a serotonin-norepinephrine reuptake inhibitor, prescribed for depression, anxiety disorder, and also used for managing pain caused by fibromyalgia and diabetic peripheral neuropathy (DPNP). It maintains the mental balance and stops the movement of pain signals in the brain. We are the Leading suppliers of Xbira 250mg Tabs. We also do Drop Shipping of Xbira 250mg Tabs. 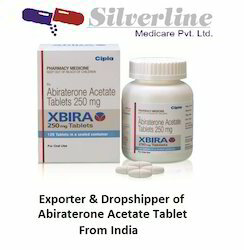 Abiraterone acetate is a type of hormone therapy. This medication is classified as an “adrenal inhibitor. 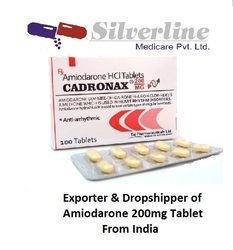 Abiraterone works by reducing androgen production in the body. Androgens are male hormones that can promote tumor growth in the prostate gland. Abiraterone acetate (often shortened to abiraterone) is a hormonal therapy drug used to treat advanced prostate cancer in men whose cancer has spread to other parts of the body (advanced cancer). It can be used alone or alongside other types of treatment. Signs of low adrenal gland hormones--worsening tiredness or muscle weakness, feeling light-headed, nausea, vomiting, loss of appetite, diarrhea, and weight loss. Tell your doctor right away if you have any serious side effects, including: easy bruising/bleeding, loss of coordination, tingling/numbness of the hands or feet, uncontrolled movements, new or worsening symptoms of heart failure (such as ankle/leg swelling, increased tiredness, increased shortness of breath when lying down). Get medical help right away if you have any very serious side effects, including: faster/slower/more irregular heartbeat, severe dizziness, fainting. 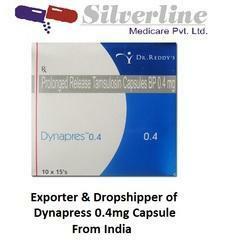 Dynapres capsules 0.4mg are used to treat functional symptoms of benign prostatic hyperplasia (BPH) in men with an enlarged prostate gland. Dynapres 0.4 relieves the symptoms of urinary retention caused by restricted urine flow as the prostate becomes enlarged and presses against the urethra (urine outlet tube from the bladder), which helps urine to flow more easily, prevents urine backlog in the bladder and restores bladder control. This relieves symptoms like need for frequent urination, inability to empty the bladder, strain and difficulty passing urine. The improved urine flow and reduction in symptoms may reduce the need for surgery. Dynapres capsules 0.4mg contain tamsulosin, an alpha1-blocker (also known as alpha-adrenergic antagonist), that binds selectively to the alpha adrenergic receptor in smooth muscle of the prostate gland and blocks the action of naturally occurring adrenergic chemicals like noradrenaline which causes smooth muscle cells to contract and tighten. Benign prostatic hyperplasia (BPH) is due to overgrowth of the smooth muscle cells within the prostate gland and increased muscle tone of these cells. Tamsulosin in Dynapres 0.4 relaxes these muscle cells which relieves the pressure exerted by the enlarged prostate gland on the urethra (urine outlet tube from the bladder); and also causes muscle cells in the neck of the bladder to relax. The action of Tamsulosin in Dynapres 0.4 removes the blockage to urine flow caused by the prostate gland and allows urine to flow more freely through the urethra; it also relaxes the bladder neck, allowing urine to pass out of the bladder more easily. Dynapres capsules 0.4mg are formulated for modified release, which means that the rate of absorption of the active ingredient tamsulosin into your blood is controlled and you need only take one capsule a day. Tamsulosin (Flomax) is an alpha-blocker that relaxes the muscles in the prostate and bladder neck, making it easier to urinate. 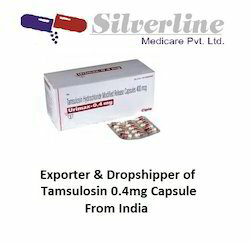 Tamsulosin is used to improve urination in men with benign prostatic hyperplasia (enlarged prostate). Tamsulosin is not approved for use in women or children. 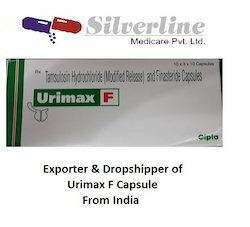 The most commonly reported side-effects of Urimax F Capsule are inability to achieve an erection, itching of skin, problems with erection, allergic reactions, infertility, and mood alterations with depressive symptom.The following is a list of possible side effects that may occur from the use of Urimax F Capsule. This is not a comprehensive list. These side-effects are possible, but do not always occur. Some of the side-effects may be rare but serious. Consult your doctor if you observe any of the following side-effects, especially if they do not go away. 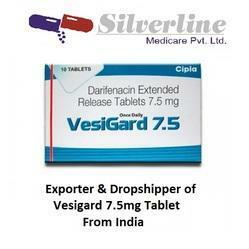 Vesigard Tablet is used for Urination related problems, Overactive bladder and other conditions.Vesigard Tablet contains Darifenacin as an active ingredient.Vesigard Tablet works by relaxing the bladder muscles. The most commonly reported side-effects of Vesigard Tablet are urinary retention, constipation, dry mouth, dyspepsia, nausea, and diarrhea.The following is a list of possible side effects that may occur from the use of Vesigard Tablet. This is not a comprehensive list. These side-effects are possible, but do not always occur. Some of the side-effects may be rare but serious. Consult your doctor if you observe any of the following side-effects, especially if they do not go away. Trade Name: - XBIRA 250mg (120 tablets) – Manufactured By CIPLA LIMITED. Composition: - Each uncoated tablet contains: Abiraterone Acetate 250mg. Packaging: - Each Bottle contains 120 tablets of Abiraterone Acetate 250mg. 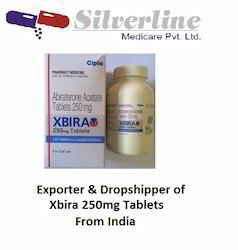 Description: - XBIRA 250mg – Abiraterone Acetate is a drug used in combination with prednisone in metastatic castration-resistant prostate cancer (formerly hormone-resistant prostate cancer) which is a prostate cancer not responding to androgen deprivation or treatment with anti-androgensAbiraterone Acetate decreased serum and other androgens in patients in the placebo-controlled Phase 3 clinical trials. It is not necessary to monitor the effect of Abiraterone Acetate on serum levels. Changes in serum prostate-specific antigen (PSA) levels may be observed, but have not been shown to correlate with clinical benefit in individual patients. The recommended dose of XBIRA tablets is 1000mg (four 250mg tablets) administered orally once daily in combination with Prednisone 5mg administered orally twice daily. XBIRA tablets must be taken on an empty stomach. No food should be consumed for at least 2 hours before the dose of XBIRA tablets is taken and for at least 1 hour after the dose of XBIRA tablets is taken. The tablets should be swallowed whole with water and not to be crushed or chewed. It is highly advisable to administer the drug under strict medical supervision and advice. Storage: Store between 15°C and 30°C in a dry placWe specialize in range of Oncology and other Life Saving Drugs and make them available for people and patients across the world at affordable prices. No matter where ever you are from we deliver medicines the fastest way possible and have been delivering our promises since 2008. We assure you of the best quality of medicines and best services in the industry. We are available for our clients round the clock and can also be reached at WhatsApp, QQ and other online social apps on the internet. Looking for Urology Segment ?